With many protests centered around Bank of America and its policies, the news of a drop in stock value of Bank of America comes as just another blow. 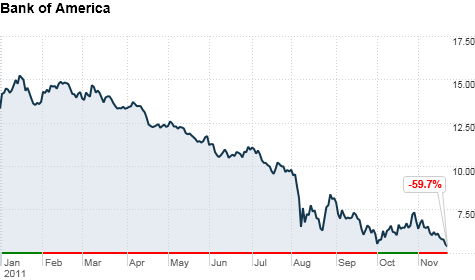 So far, this year alone, Bank of America stock has dropped a drastic 59 percent. Today, it was getting dangerously close to a two year low. And even worse, according to the Wall Street Journal, the financial company is struggling to meet new financial regulations and requirements in the United States. Bank of America might be selling some of its business ventures in order to better meet the regulations. The hope would be to get rid of assets that are costing them money in order to free up more capital. In addition, the Federal Reserve is going to be demanding reports from not only Bank of America, but also Citigroup, Wells Fargo, JP Morgan Chase, Goldman Sachs, and Morgan Stanley early next year in order to make sure all of the banks are on track.